What it’s about: England has many legends. King Arthur. Robin Hood. An exciting cricket match. And the legend of the green children. As the story goes, two children appeared in 12th-century Woolpit, a village in Suffolk. Their skin was green, they spoke in an unknown language, and ate only fava beans (called broad beans). The story has remained a subject of fascination for centuries, and has been retold in plays, poems, and stories up until the present day. Strangest fact: The story might be true. In the mid-12th century, when the Woolpit story is believed to have taken place, there was a wave of Flemish immigrants to England, who were persecuted and often killed under Henry II’s reign. Orphaned Flemish children would be, to small-town English folk, dressed in outlandish clothes and speaking a strange, possibly made-up language (Flemish is a not-as-far-as-we-know-made-up dialect of Dutch). Even the green color has a plausible explanation. Hypochromic anemia, or “green sickness,” is a disease that leaves red blood cells paler than normal. That absence of red often leaves sufferers with a greenish tinge to their skin. In the legend, the children eventually lose their color. While green sickness can be caused by infections or toxic agents, it can also be the result of a vitamin deficiency, so two children alone in the woods (or two picky eaters who only accept fava beans) could very well have contracted the disease, than recovered once they started to adopt a more well-rounded diet. Thing we were happiest to learn: The green children adjusted. They did eventually lose their green color, expand their diet beyond beans, and acclimated to village life. A man named Richard De Calne took them in, and helped them adjust. The brother eventually fell ill and died, but the sister lived for many years as a servant in the De Calne home, and eventually married. Research into the De Calne family history indicates she may have taken the name “Agnes” and married Richard Barre, a medieval judge and clergyman who worked for kings Henry II and Richard I. Thing we were unhappiest to learn: There are some, let’s just say, less credible theories behind the green children. In 1996, astronomer and sci-fi author Duncan Lunan “hypothesized” that the children were aliens transported to Earth in a Star Trek-style transporter malfunction, and that they were green not because they were aliens, but because the color was “a side effect of consuming the genetically modified alien plants.” The weirdly specific theory also posits that their home planet was unbearably hot on one side and unbearably cold on the other side, forcing its alien inhabitants to live in a small temperate strip at the equator. In the original story, the girl claimed they came from “a land where the sun never shone and the light was like twilight.” Surely anyone hearing that story would come to the same conclusions. Also noteworthy: Less literal explanations put the story of the green children squarely in the realm of English folklore. A number of other stories involve people from a secret underground world (one possible interpretation of the green girl’s land of perpetual twilight). 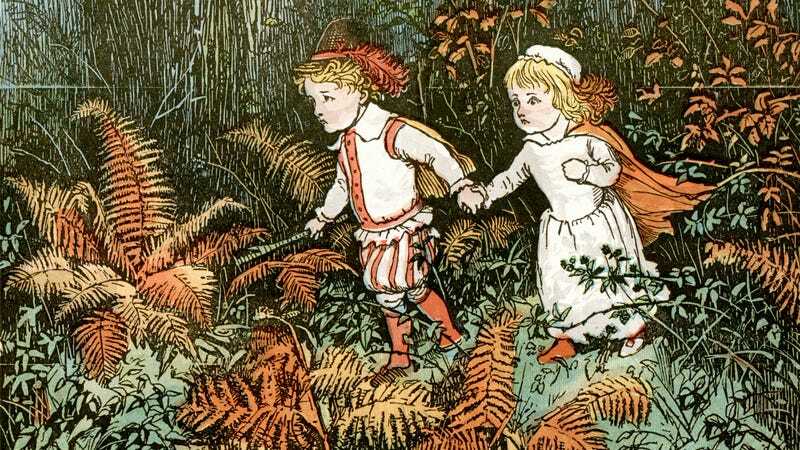 And the story has some overlap with that of the “Babes In The Wood,” abandoned in the woods by a wicked uncle, and usually portrayed as a brother and sister. Best link to elsewhere on Wikipedia: The Woolpit story is part of a much larger tradition of probably apocryphal English history. The masterwork in that genre is Geoffrey of Monmouth’s The History Of The Kings Of Britain, a 12th-century epic that stretches back 2,000 years, to the founding of Britain by the Trojans, and chronicles centuries of history before the Anglo-Saxons conquered the island in the 7th century. While it was once taken as gospel, it’s long since been discredited, although it’s still seen as a valuable work of literature. Among other things, it’s the first known telling of King Lear, and popularized the legend of King Arthur. Further down the Wormhole: We don’t have to go far this week, as the green children are just one fascinating story on the list of People Whose Existence Is Disputed. We’ll take a look at these alleged people and their alleged stories next week. What creatures are lurking out there in the night? Wikipedia knows!